Everyone wants to have a radiant, flawless, smooth skin. But it’s also true that everyone has a different skin type, which means that we all need to follow different steps to achieve healthy and beautiful skin. However, there are certain steps that can help you take better care of your skin, regardless of your skin type. These steps are very simple and will make anyone’s skin more radiant and achieve a younger-looking complexion. 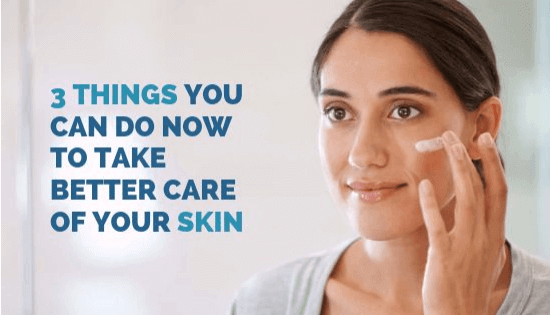 Read this article to find out the 3 things that you can do right now to take better care of your skin. Drinking enough water throughout the day isn’t only good for your skin. The human body contains up to 60% of water in males and 55% of water in females. As we age, that percentage drops steadily to around 50%. If most of our body is made up of water, it makes sense that keeping ourselves hydrated can improve the health of any of our organs. And skin, in fact, is the largest organ we have. Our skin is made of 64% water. Therefore, it should come as no surprise to learn that, by drinking plenty of water, you’ll be improving the condition of your skin. Dehydrated skin loses density and becomes dry; this will make any fine lines become much more apparent. Dry skin is also more brittle, flaky, and prone to injuries. Hydrated skin, on the other hand, will have better elasticity and density. This, in turn, will make your skin look tighter and reduce the appearance of fine lines and wrinkles. Keeping your skin hydrated is also a great way to aid your body’s natural cicatrization process, reducing acne and blemishes. It can also help improve the symptoms caused by skin conditions such as psoriasis and eczema. Drinking water can also help your body flush toxins faster and more effectively. This will lead to a brighter, more youthful complexion. We all have different water intake requirements that vary according to age and medical conditions; however, most people need to consume approximately eight 8-ounce glasses of water each day. This equals 64 ounces of water, which is roughly half a gallon or 2 liters of water. You can also increase your water intake by consuming water-rich foods, such as cucumber, tomatoes, broccoli, oranges, watermelon, cantaloupe, lettuce, and strawberries. It would be wonderful if we could all follow the same skincare routine; however, different skin types mean that some products are better suited to certain people rather than others. Finding the right products for your skin type and lifestyle can take some trial and error, but it’s an important part of developing your own skincare routine. Your skincare routine can include more or fewer steps, depending on your preferences. Before buying any products, you need to establish which type of skin you have. This information will allow you to understand the type of products that you need to use. A good skin care routine should include, at least, a facial cleanser, exfoliator, moisturizer, and sunscreen. You can add eye creams, toners, face masks, and serums if you wish. Once you find a skincare routine that works for you, maintaining it will keep your skin looking great. Keep in mind that it’s never too early to perfect your skincare routine. Even if you’re too young to have fine lines or wrinkles, using the right products at any age will prevent signs of aging from showing up too soon. Proper skin care can also reduce blemishes and acne, improve dark circles, and brighten your complexion. Getting a facial is more than just a great way to pamper yourself. One of the most popular facial treatments right now is the Hydrafacial. Unlike many other types of facials, the Hydrafacial doesn’t leave your skin feeling irritated or puffy, and it delivers results in approximately 30 minutes. A Hydrafacial starts cleansing your skin and peeling it gently through a soft exfoliation and skin resurfacing technique. This treatment avoids the use of steam to open up pores since experts believe that steam can dilate blood vessels and produce redness and puffiness. Instead of performing manual extractions, a technician will use vacuum-powered extraction to remove debris from your pores. Then, the skin is saturated using nourishing substances like glycolic acid, salicylic acid, peptides, growth factor, vitamins, and botanical serums. The Hydrafacial provides great results without causing pain or discomfort, and it works for all skin types. Evening out your skin tone. Improving skin elasticity and firmness. Improving oily and congested skin. Creating a better skin texture. If you have specific skin concerns, special boosters can be added to your Hydrafacial to address them. These include boosters to improve discoloration, further reduce fine lines, minimizing sun spots and blemishes, and improving signs of aging. A Hydrafacial doesn’t require any downtime, which makes it the perfect treatment to get during your lunch break or before going to an event. If you want to start taking better care of your skin but don’t know where to start, these 3 simple steps can help you. Remember to drink enough water throughout your day, eat plenty of water-rich foods, follow your skincare routine each day, and get facial treatments, and you’ll be on your way to achieving a radiant complexion!